If we were the judges then Lake Manyara would win the award for East Africa's prettiest park. Forested mountains rise evocatively to one side, the perfect photogenic backdrop to the animals on the plains. Lake Manyara is home to beautiful wildlife. You enter through thick woodlands, passing dozens of elephants and hundreds of noisy birds, before skirting a lake packed with hippos. Baboons congregate in their thousands and you'll hear them long before you see them. You don't just see majestic old trees; you find lion prides draped across the highest branches. And you're never just admiring giraffe and elephants amongst the dramatic boulders; you're also hearing the cacophonous shouts of hippos and hornbills. We think this area deserves more recognition. This handsome little park suffers from its location on Tanzania's northern safari circuit. Many people miss it out or skip through it a single afternoon, on route to the more famous Ngorongoro and Serengeti. We think that Lake Manyara struggles to attract the recognition it deserves. It's the first safari stop for many first-time safari goers, who are eagerly anticipating large herds and a big-five experience, which isn't Lake Manyara's forte. But take your time, appreciate the visual bounty, and this little park will wow you when you least expect it. 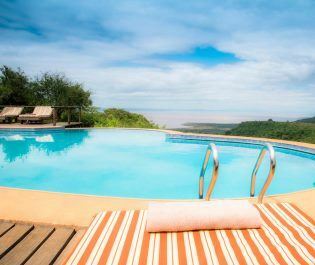 Where to stay near Lake Manyara. As most visitors are on route from Arusha to Ngorongoro Crater, the accessible northern side to Lake Manyara gets busy in the afternoons. We would recommend spending one or two nights in the park, allowing you to explore deeper into the park, especially the leopards that hang out in the southern woodland. Beautiful sunrise game drives are as charming as any in Africa and by staying at a camp inside the park, you tune your senses to all the subtleties of the wild. Lake Manyara divides opinion and we've found that those who spend a night have a very different experience from those who only spend an afternoon. While it can be tempting to push on to the more famous neighbouring parks, we've always been enchanted by a one or two-night stop amidst the lake and woodland. 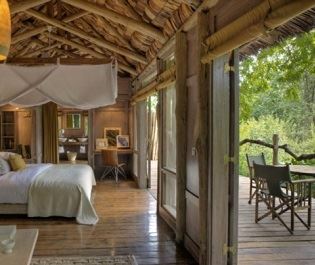 Inspired by Lake Manyara's famous tree climbing lions, this luxurious lodge offers stunning tree house suites perched high up in the trees. 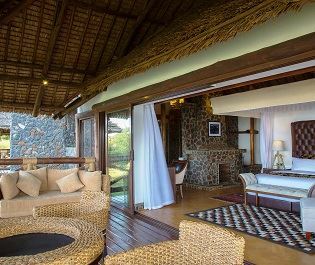 Brand-new contemporary lodge that provides five-star hotel quality accommodation and wonderful views over Lake Manyara. A contemporary lodge that feels more like a five-star boutique hotel; outstanding rooms, on-site spa, swimming pool, and plenty of romance.